It’s clear by now, Tri Force Heroes isn’t the greatest entry in The Legend of Zelda series—plagued with a limiting single player campaign, and how difficult it is to get together with friends for multiplayer sessions. Despite this, there’s a lot that makes the game a joy. Nach and I talk about all the good and bad of Tri Force Heroes, and our time with the game thus far. 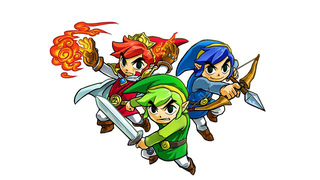 N. Ho Sang (Zarnyx): Let’s talk Tri Force Heroes! And just how jealous I am that after a week, I’m still only rocking my Kokiri clothes. I love my tunic, and it’s quite fetching really, but I’m having a real problem gathering materials and rupees to change my wardrobe to my heart containers’ content! It’s probably due to the fact that I’m no good at the single player campaign. My brain co-ordination can’t handle switching out between those freaky doppels. It’s a tedious exercise going it alone. J. Acosta (Nach): Pffft… you couldn’t rock the outfits even if you had the money and materials. Zarnyx: If you could only see the side eye I’m giving you. If we were playing Zelda together right now, I’d give you the icon for “Nooo”. And still it wouldn’t be the right one to aptly describe my disdain for you at the moment. Nach: That’s right… the only way to show your disdain is by channeling your inner False Hero and throw me off a cliff. Zarnyx: I promise I will remember to do this the next time we play. I must say, those icons have worked well to get us through the online gaming sessions we’ve had. We’ve played together both locally and over the internet and so far, both ways have worked brilliantly. Nach: Funny enough I’m super silent when playing local, don’t know if you noticed when we played local, I only used the icons whenever I needed something. Regarding the quality of the connection, I only encountered lag a couple of times, and that was when playing with strangers. Zarnyx: Except when you made fun of me for calling myself a Master Archer, yes...you didn’t say that much. You did laugh at our third party member, Swan and I though. I could tell you were exasperated sometimes. That wasn’t my fault! The Walking Dead was on. While icons are fun, I’m certain they could always be improved upon. There’s a lot that can be improved upon. But I especially enjoy when someone snarkily gives me the thumbs up for doing something stupid. The frequent cheering is your thing. Nach: I was just being a donk while you guys were watching TWD. Zarnyx: Mhm. Sure. Though I also like how quickly some of the levels go. We could scream during Walking Dead and play at commercial breaks. It’s been harder organizing online times but that’s just life getting in the way. How have you fared playing with strangers? Nach: There’s alway the random disconnect, and of course the fool who leaves as soon as the level starts. But in general people are quite understanding when playing online, and I’ve noticed how they have come up with unique ways to express themselves. Zarnyx: The other night we were playing online, and even though Swan was with me and telling me what I was supposed to do, I couldn’t figure out something. It was a level with the weights. Sometimes I’ll just let you take lead since I know you may have a better equipped outfit to walk on ice or whatever. Do you think playing with strangers has this same sort of flow? And have you ever been stuck really bad somewhere because no one could figure out what to do? Nach: It kinda works that way. There’s always an issue when more than one player wants to take the lead, but it gets sorted out pretty quick. I do have to point out that every now and then you get a player who thinks he/she is the big cheese. Zarnyx: That’s understandable. I would think though that the outfits sort of dictate who’s going to do what in a level, at least where items and environment come into play. It’s not perfect but there’s a lot of variety. Zarnyx:... what’s my purpose on the team, Nach? Nach: To be the I, cause you don’t follow orders! I’m the princess here… You peasants have to follow my orders! Zarnyx: ...Well it’s not like I can do everything with just a Kokiri outfit. We can’t all be the prettiest princess! (I’m totes okay being the cactus-thing) What’s your favorite outfit so far? Nach: Depends on what I’m looking for. I love the Legendary Dress, and the Cheerleader outfit is kinda cute. But there are certain costumes that are extremely useful, like the Boomeranger or the Parka Outfit. Zarnyx: Yeah, the style is on point in this game (on fleek?). Which it has to be given that Hytopia is all about fashion. That story and those characters… it’s all hilarious! The other day Swan saw the one-piece black suit wearing, cursed Princess Styla hiding out in town for the first time. She decided then that her Halloween costume would be “A Princess in Peasant’s Clothing”. Nach: I don’t get it… she could be one of those Black Light theatre performers. People still like that concept, right? She could also blue herself and audit for the Blue Man group. Zarnyx: Naw, like you, the Hytopians don’t like to wear black and/or white outfits. To the Drablands with you! Nach: Seriously… why are people so sad with their lack of colors? Black and white are not colors, people! Zarnyx: Of course, this just means the designs in Tri Force Heroes are so cute, and clever enough that clothing also acts as a wide range of abilities and maybe even items? Kinda? Nach: I’d like to think of them as the masks of Majora’s Mask. Each one serves a purpose but you can use them in any situation. They’re versatile…. like… well clothing! It all makes sense! Zarnyx: That’s a good way to think of them, but some will be more effective in different situations too. Zarnyx: Well… I would. Because it’s cute. Nach: That’s the reason why you failed us in the desert stage… you didn’t prepare for the occasion. Zarnyx: But at least I looked good doing so. Nach: …………………….… If there’s one thing I like about these costumes is spending countless hours at Madame Couture’s mirror prancing in my newly crafted costume (She’s the one who crafts all the outfits in the game). Gathering the items and money to get that outfit you want is so rewarding! Zarnyx: Except when you pick the run-of-the-mill items, like I often do. That’s all part of the fun I suppose, but again, I do find it hard getting enough rupees and items. How can I ever do so in single player mode? I can barely get out of the first area. Nach: Oh right...you talked about the single player at the start of the conversation and I ignored you. I… don’t have a lot of issues with the constant switching, but I cannot say I enjoy it. It is tedious, then again the game was never meant to be a single player experience, yet the focus point of all critics is how the single player is a mess. I agree with them… but that doesn’t mean the rest of the game is bad, on the contrary, this is the most fun I’ve had with a Zelda game since Four Swords. Zarnyx: I’ve been having a lot of fun with the multiplayer aspect, for sure. But I liked how Four Swords Anniversary handled just having one other local player. Swan and I had a blast playing on our commute. With Tri Force, we can’t do that and even though strangers are good enough to jump on and help out if you’re not around, it would have been nice to keep it personal with just both of us. Nach: True, another thing Four Swords Adventure on the Game Cube also did right was how it tackled the single player mode. The four links were always on screen following you, but you could alternate between different formations to get through the obstacles and puzzles. I think Tri Force should have looked at what FS did and mimic those mechanics. Not that I’m saying the totem mechanic is bad… it’s those stupid doppels! Zarnyx: And their soulless eyes! ..shudder..
Zarnyx: The game does have some hilarious animation. What’s not hilarious are those challenges. They’re so fun but ugh, so hard too. Nach: Well… that’s why they’re called challenges! Not all of them are suited for single player, or online with strangers. Zarnyx: I tried a few by myself, and a few with GBD. It was really tough doing certain challenges on my own with those doppels. Timed challenges showed just how awful I really was at switching out characters. With GBD, we fared a little better. They’re interesting and add a whole new level of difficulty and fun to the game. Replayability too, right? Nach: I would say that most of the replay value of Tri Force Heroes is in those challenges. They change the way you confront a level, even if the level itself hasn’t changed much. I mean the puzzles are the same and the structure of four stages is the same, but having to play through the level in the dark, or with a wallmaster pursuing you is a whole different experience. Zarnyx: ...good thing I’m awful at them because I don’t ever want to know the terror of wallmasters chasing me. Nach: It can be frustrating, but going through them is the best way to get those rare materials and the extra dosh to pay for the extravagant outfits. Zarnyx: Like that Cheerleader Outfit you’ve yet to show me. Can I borrow it…? Nach: No! It cost me 9,000 rupees to gather the materials! Plus, the merchant in the plaza finally noticed me! Zarnyx: That merchant… that shows how insane this game is. Zelda games are generally serious affairs, not so for Tri Force. All the NPCs are all caught up in their own weird lives. Every Zelda has its own weird flavor in some form—creepiness, strange characters—but usually not the focus of the story. This one goes all out to be as lighthearted and silly in every way. Everyone’s over the top! It’s a very distinct, nonsensical approach to Zelda, and I love it. Zarnyx: Shhh… no spoilers. I do like how the game will change where NPCs are, what they’re doing, and how they react to things. She shouted the magic words! Kooloo-Limpah! Zarnyx: Haha, this game is very tribute heavy to the history of the franchise. Nach: Not only to the franchise… but to Nintendo. The Parka outfit is a homage to the Ice Climbers, and the Hammer outfit is modeled after the Hammer Bros from Super Mario Bros.
Zarnyx: Ooo, and the little Mario sound effect when you toss fireballs with the fire gloves. Nach: Yep, I love how the game is full of little secrets and easter eggs. They even make fun of the Hero of A Link Between Worlds. Zarnyx: As they should. You know what else I love? The Music Ball that’s hidden in the ceiling of the multiplayer lobby. Why is it every time we find the one that plays “The Lost Woods”, we can’t get it together? Hitting that music ball to hear various themes across the series is so cool. It’s a treat and a fun way to kill some time while waiting for friends to join. I feel bad running Link into walls repeatedly though. Poor guy. Nach: In some way it is the same thing that A Link Between Worlds did with the Milk Bar themes. Take classic Zelda themes and re-imagine them with a limited set of instruments. It’s a joy to the ears. Zarnyx: Much like how Hytopia’s got its own distinct, strange little vibe and the French-influenced music with those accordions. It’s got street and style savvy awareness. It’s just fantastic. There’s so much more to the game’s music too. This soundtrack is one to remember. Nach: Oh man… don’t get me started with the music. The arrangements are amazing, the layering is gorgeous and best of all it’s dynamic! Have you noticed that depending of your position in the totem the music changes? Zarnyx: Those little details make the game really special (and no I didn’t because I’m usually too busy dying). It’s really unfortunate a lot of people will likely skip (or have skipped) this entry. There’s so much fun to be had with Tri Force’s absurd plot, tacked on puns and the characters fully committed to their roles, but I understand how limiting the gameplay can be too, and I can’t blame them either. The setting is a nice change for Zelda otherwise, and the smart puzzles and excitement of the series are still all here. Nach: It’s a classic Zelda with a different flair. Sure it’s missing the serious tone that the series is known for, but everything else is there. It’s a shame that very few have actually bothered to appreciate the hard work put into the game. Follow N. Ho Sang (aka Just Another Kokiri Zarnyx) on Twitter at @Zarnyx if you’re feeling adventurous, or you can read her articles here. Follow J. Acosta (aka The Cheerful Cheerleader Nach) on Twitter at @nach212. He’ll do a pom pom move just for you, if you do.